On Tuesday, Sept. 19, representatives from several Alabama outdoor organizations gathered for a press conference at the Lower Wetumpka Shotgun Sports Club to promote the forthcoming National Hunting and Fishing Day on Sept. 23. 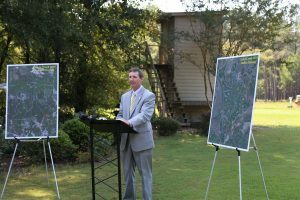 William Crawford, director of the University of Montevallo President’s Outdoor Scholars Program, was one of six speakers at the press conference. William Crawford, director of the President’s Outdoor Scholars Program, speaks during a press conference in Wetumpka to promote National Hunting & Fishing Day. He discussed how the program not only engages UM students with outdoor activities, it also offers an education and connections within the diverse outdoor industry. Additionally, Outdoor Scholars students J.T. Russell, Will Dewey, Dallin Hatter and Adam Carroll participated in a clay shooting demonstration at the event. “It’s a huge opportunity to promote doing what I love at the state level,” said Russell, a sophomore business management major. Other organizations at the event included Alabama Black Belt Adventures, the Alabama Department of Conservation and Natural Resources, Alabama Wildlife Federation and the Congressional Sportsmen Foundation. In 1971, Congress established National Hunting and Fishing Day to recognize hunters and anglers for their leadership in fish and wildlife conservation. Since then, the fourth Saturday of every September has been set aside as NHF Day. To celebrate, outdoor retailers, shooting ranges, private and public lakes, state parks and other parks across Alabama are offering discounts on various services or waiving admission fees on NHF Day. For a list of national and state participants, please visit: http://alabamablackbeltadventures.org/events-calendar/national-hunting-fishing-day/. For more information on the President’s Outdoor Scholars Program, visit: https://www.montevallo.edu/academics/experiential-learning/presidents-outdoor-scholars/.